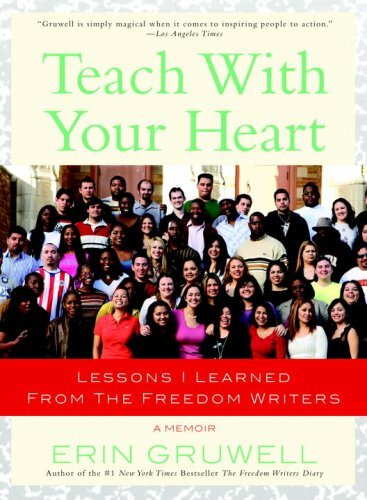 The full title is Teach With Your Heart: Lesson I learned from the Freedom Writers: A Memoir. I first read this book late in high school or early in college. Now, in my 5th and final year of college, I came back to it because I was feeling down about education. I’ve finished the book for the second time feeling inspired all over again but, unlike my first read-through, I can look at it critically. While the title is pretty cheesy, it’s spot on with what the book and Erin is about. She didn’t really know what she was doing or how to engage her students, so she taught in a way that touched her students’ hearts: she taught about what mattered to them. Lesson #1: Teach what matters to your students. While this story may be an exception, it’s a beautiful example of the impact one teacher can have in one year. While this story details her work with students from 9th through 12th grade and beyond, Sharaud, for instance, was highly impacted by Erin and she only taught him for 1 year. Lesson #2: Great transformations are possible. Like Erin, I was disheartened by the lack of support her fellow teachers showed. Perhaps they were exceptional, but perhaps not. Reading about how the teachers tried to fail Erin’s students and wrote slanderous things in her mailbox, I can’t help thinking about “Waiting for Superman” and how (some) public school teachers were vilified. And I suppose there are teachers like that, but we can’t go around expecting teachers to be heroes or enemies. Lesson #3: Hope for the best but prepare for the worst. It was inspiring to read how Erin was unsure about her teaching methods and basically everything else she was doing. She was scared and made mistakes. She is no Wonder Woman. She’s a regular lady who cares deeply about her students and education. Lesson #4: Anybody can be that person. A few people on goodreads are angry for several reasons: 1: Erin’s methods aren’t practical, and 2: there’s no information about specific teaching methods. 1: I don’t think Erin goes around telling people that you have to spend thousands of your own dollars, alienate your fellow teachers, meet Steven Spielberg, get a divorce, stay with your students from 9th through 12th grade, take several trips to Washington, D.C., fly to Europe, invite famous people to your classroom, or hold 3 jobs. I bet that Erin tells people that you must, essentially, teach with your heart by believing in each student and by teaching powerful pedagogy. She runs the Freedom Writers Foundation and trains teachers to be Freedom Writer Teachers (one of my dreams), and she wouldn’t still be in business if her methods couldn’t be replicated to some extent. Furthermore, there is a teachers’ edition of this same book that aligns with standards and includes teaching techniques that I’m positive don’t say anything about having to go to Europe or working 3 jobs. 2: I definitely wished there was more information about specific teaching methods, but that’s not what Erin’s memoir is about. That’s what the teachers’ edition is for. What we (and by “we” I mean “I”) need to remember is that Erin’s circumstances were unique. She had a rich father, no children to care for, a supportive superintendent, and connections to rich and powerful people. To replicate Erin’s story is impossible but to have our own stories is not. From what I gathered from snippets in this book is that, when creating their “secret sauce” for success, it was all about family and support, not about knowing the right people or having enough money to travel across the country/world. I wonder how realistic it is to teach these empowering pedagogies in this era of high-stakes, standardized testing. I’d imagine it is possible if one can validate every activity by backing it up with standards. But then again, teaching students to fight the system, to think for themselves, and to be critical of their world will be a detriment when taking these tests. I also wonder about a majority of the original Freedom Writers. A handful of them work for the Freedom Writers’ foundation and make motivational speeches – Sharaud and Maria, for instance. Several of them traveled around the country with her, and about two dozen enrolled in the university where she taught. What about the other 100+ students? Were they lost without their Freedom Writer family? Did they make better lives for themselves? Did they “fall through the cracks”? Lastly, I want to mention how powerful this story can be in the hands of students. The Freedom Writers Diary is used (and banned) across the country. As a hopeful middle school teacher, I wonder if I could use the text, which has all sorts of profanity and violence, but it’s worth a shot. Even if I have to hand type the diary entries and remove the profanity, I think it’d be worth it. Here are 150 kids whose cards were stacked against them, and look where they are now.